The credits, right there on screen, insist that Quai d’Orsay is “un film de Bertrand Tavernier,” but I don’t believe it. Maybe some imposter named “Bertrand Tavernier,” appropriating the name of a director who, to put it mildly, is hardly associated with satirical farce. Adapting former government speechwriter Abel Lanzac’s autobiographical graphic novel of the same title, “Tavernier” tries to stage scenes with a strangely desperate sense of whiz-bang, pow and pop, as if this would stir interest for just about the world’s fattest target for ridicule: high government officialdom. Lanzac’s alter ego, played by the impossibly handsome and ridiculously busy actor Raphael Personnaz, finds himself thrust into the midst of the absurd typhoon that is the office of France’s foreign minister, where he must re-write, and re-write, and re-write, the minister’s nonsensical speeches, whether on the crisis in fictitious Iraq stand-in Ludmenistan or an anchovy war with Spain. 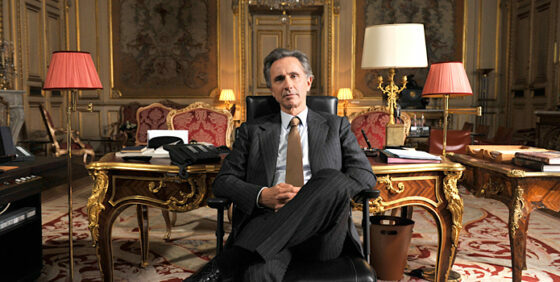 Thierry Lhermitte plays this verbose, preening idiot with a determination that becomes grating. The clear intent is to apply a Molièrian sensibility to contemporary French and global politics—a great idea, actually—but it’s all in the playing, and the playing is pure sweat and work. And that’s no fun at all.